Their story is encompassed in the Ossian Tales and memorialised in locations across the parish. as of June 2018 there is now a wonderful landscape installation celebrating their story of love up in the hills above Taynuilt, in amongst the wind turbines. hunter, singer and warrior of the court of his uncle King Conchobar mac Nessa of Ulster. The site consists of a set of monuments and earthworks spread over two square kilometres. The daughter of the royal storyteller Fedlimid mac Daill, and before she was born, it was prophesized she would grow up to be very beautiful, and that kings and lords would go to war over her, and so it happened. According to the Táin Bó Cúailnge (legendary tale from early Irish literature set in the First Century>, Cathbad the druid descrbed her as becoming "a woman with twisted yellow tresses, green-irised eyes of great beauty and cheeks flushed like the foxglove,"
King Conchobar had raised her away from all others in order to marry her himself when she was old enough, but she met Naoise and they eloped together. The King was furious and tried to murder Naoise, and wars were fought whereever they went. Eventually together with Ardan and Ainnle, Naoise's brothers, they fled Ireland and came across the water and made their home here at Dun mac Uisneachan in Ardchattan. 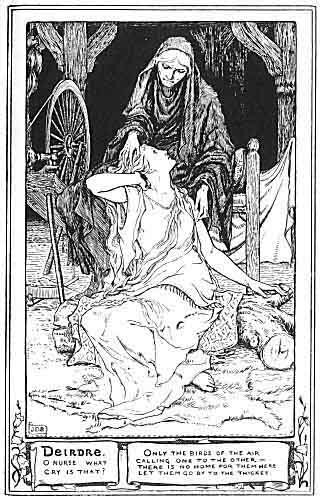 They had a time of plenty, peace, hunting, and living well but the King found out and tricked them into returning to Ireland, where he succeeded in killing Naoise, and Deirdre also died, whether of a broken heart or smashing her head on a rock out of a carriage, depending on the version of the story. 1905 Alexander Carmichael (1832-1912), renowned folk lore and story collector published : Deirdire and the Lay of the Children of Uisne, as a the result of nearly forty years’ interest, this version was taken down originally in 1867 from the recitation of John Macneill, an 83-year-old cottar from Barra. We'd swithered about Gassan all Spring. If we'd known earlier about Beregonium - Barr nan Gobhar, Ridge of the Armourers - that would have been pair for the ancient Smith-cult founded by Tamaomaru, Kenkya and his son Gassan. Then there ws a provisional plan to send s climbing-poet or poet-goat up Beinn Mheadhoin, to bivvy under the Shelter Stone and cross the stepping stones. But that mountains beyond another mountain, Ben Macdui, and although Basho climbed to the snow patches almost as far as the gates to the clouds, we opted in the end for craft. We couldn't resist the invitation to stay with Annie Briggs, at Kilmiddlefern, and that brought us close to dreich Bonawe. But Etive caught our imagination and we looked at her both ways along the loch. Station 37 Collages Loch Etiveside (August) and Glen Etive (September), this time and that, tracking the Deirdre myth inland from Benderloch/Beregonium, deep into the mountains, compassing the the crown of Ben Cruachan W-E, looking for the places she and the three sons of Uisneach, Naoise chief among them, enjoyed their chaste picnics, by the side of Deirdre's waterfall in Glen Etive, or in her House of the Sun (Tigh Grianach), or in Naoise's wood (the Coille Naoise) in the bay between Achnacloich and Aird's Point. Dun Mac Uisneachan (Fort of the sons of Uisneach)- has a fascinating provenance. It stands on the mound between Dun na Mara and Port Selma and features in both recorded history and legend. The site was constructed over many centuries beginning in the Iron Age. a very old settlement, possibly deriving from cadail lios the garden or orchard where Deirdre’s bower was reputed to be. Bay of the court or palace -again, a possible reference to the legend of Deirdre. the sunny place, possibly connected with the legend of Deirdre of the Sorrows who was said to have a ‘sunny bower’ in Glen Etive. The Glenmasan manuscript is a 15th-century Scottish vellum manuscript in the National Library of Scotland, Edinburgh, where it is catalogued as Adv. MS 72.2.3. It was previously held in the Advocates Library, Edinburgh, where it was classified as MS 53. The compilation contains Scottish Gaelic literary texts dealing with matter of the Ulster Cycle, such as the Táin Bó Flidhais and Oided mac nUisnig (the latter a version of Longes mac n-Uislenn). Deirdre, daughter to the King of the Picts, and her youth here on Loch Etiveside, where she’s said to be buried. ‘She spent her girlhood at Loch Etive in the company of three fine lads of her own age, the sons of Uisneach. Her closest friend of these three was Naoise, but their association was a boy-and-girl idyll—all three of the lads loving her deeply and she them. Brought up as they were under the strict supervision given to a daughter of the Pictish royal house, there was no question of love-making in the full sense. The boys hunted for sport and food, bringing to Deirdre the flesh of deer, fish, and badger; they would picnic by the side of Deirdre's waterfall in Glen Etive, or in her House of the Sun (Tigh Grianach), or in Naoise's wood the Coille Naoise in the bay between Achnacloich and Airds Point. Written and recorded by brothers Mychael & Jeff Danna between their other scoring projects, A Celtic Tale is the soundtrack to an imaginary film of the Irish legend of Deirdre. Both the album and the legend reflect many aspects of love and sorrow. The Danna brothers mix Celtic folk, symphonic, and ambient music into a distinctive and fitting setting for Deirdre's star-crossed story. Though she is betrothed to a king, Deirdre finds her true love; she and her lover are exiled. When they try to return to their land, Deirdre's lover is killed, and she is imprisoned by the king she was to marry. Love and war blend in Deirdre's story; similarly, the music combines authentic Celtic instruments such as fiddle, tin whistle, flute, uilleann and highland pipes, and wire-strung harp with orchestral power and electronic atmospherics. Both listenable and powerful, A Celtic Tale showcases the Dannas' skill for creating emotionally accessible, technically beautiful music.